The unusual retainer plate of the Estetic 2D is made out of zamak. Both the retainer plate and the hinge cover plate are powder coated to protect against corrosion. Thanks to a range of colours, the Estetic 2D can be matched to the colour of the door frame. This enables the door designer to take on board various influences on the choice of door colour. 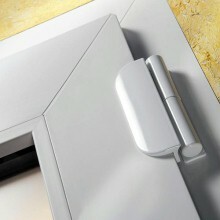 The Estetic 2D offers simple horizontal and vertical adjustment of the door with a single Allen key after hanging. Fitting the hinges to the door is also quick and easy using a custom gauge, which guarantees the accurate positioning of the hinges on the door. For further technical documentation, please contact our Customer Services Team on 0113 2085 500. SFS Group Fastening Technology Ltd.